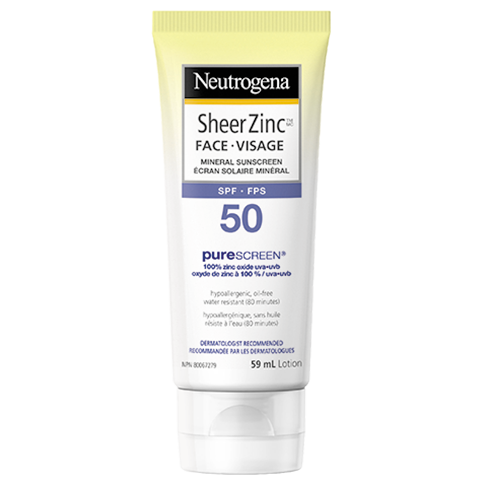 Neutrogena Sheer Zinc™ Mineral Sunscreen SPF 50 with Purescreen® naturally-sourced 100% zinc oxide technology. 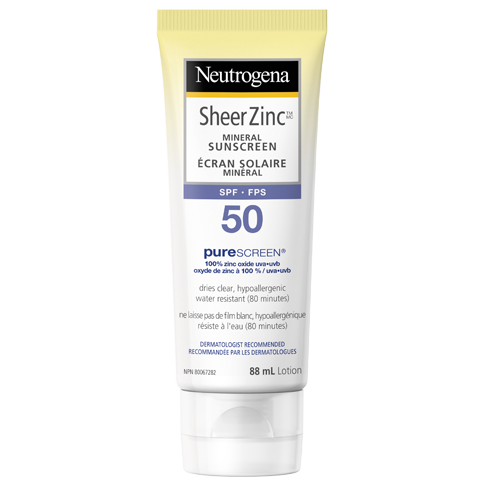 This gentle formula delivers effective broad spectrum protection against burning UVB and aging UVA rays – and if used with other sun protection measures it can decrease the risk of skin cancer and early skin aging caused by the sun. Plus, it's mild even on sensitive skin, and it's free of fragrance, parabens, phthalates, dyes, and irritating chemicals. I have had problems for years with reacting to sunscreens. I generally purchase very expensive, zinc based sunscreens. This product is reasonably priced and it doesn't go on as "white" as other zinc products I've used. Keep in mind, it will have a white coverage at first, but it does go away. Great product and it has worked for me.